The Ville offers a rotating bean, cycling through various roasters from around the world to provide a diverse selection of coffee. To start off, Oosterholt is featuring Shock Coffee from New York, which is known for containing 50 percent more caffeine than the average roast. For those looking for something more consistent, The Ville also has a regular supply of Java Blend’s organic Colombian medium. With baked goods from Michelle MacDonald’s Buttered Bliss, customers are invited to pull up a stool at the 18-foot live edge maplewood bar that wraps around the cafe as they bite into almond bourbon pecan tarts and lavender blueberry doughnuts. “I’m basically just made out of Buttered Bliss and coffee now,” Oosterholt says, laughing. Sandwiches are also available and made fresh-to-order. The sunriser, crafted for the morning breakfast crowd, consists of applewood smoked ham, spinach, tomato, mayo and old cheddar on a croissant or English muffin that is grilled with an egg wash. Other sandwiches include the vegan clubhouse and the BTM (basil, tomato and mozzarella—the sandwich version of a Caprese salad). Oosterholt, 24, has been in the restaurant industry since she was 12. 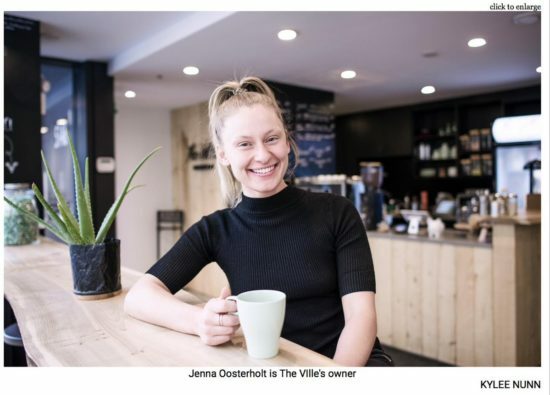 Originally looking to open a gourmet coffee cart at Bishop’s Landing, she upgraded her idea from cart to cafe upon noticing the empty space that used to house Smiling Goat’s Sackville Street location. A strong believer of simplicity, Oosterholt furnished The Ville in industrial textures, such as wood and metal, and decorated with praying plants and vines that dot the black and white walls. The bathroom, Oosterholt’s favourite place, has a collection of framed quotes, similar to scribbled notes left on bathroom stalls, except these notes are words of wisdom she has gleaned from family and friends over the years.